The first 24 years of the Koppenbergcross history have been defined by Belgian success, and specifically, Belgian legend Sven Nys. Belgians have won the last 13 editions of the race heading into 2016. During his storied career, Nys won the event ten times, including seven straight at one point. 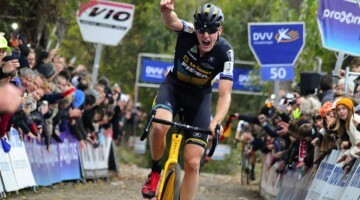 Defending World Champion Wout Van Aert (Crelan-Vastgoedservice) appears poised to add his name to that storied history, as he sought his third-straight Koppenbergcross victory in the 25th running of the event on Tuesday. After two convincing wins at the 2016 American CrossVegas and Jingle Cross World Cups, Van Aert has been receiving stiff challenges from Dutchman Matthieu van der Poel (Beobank-Corendon) and after last weekend’s victory at the European Championships, fellow Belgian Toon Aerts (Telenet Fidea Lions). 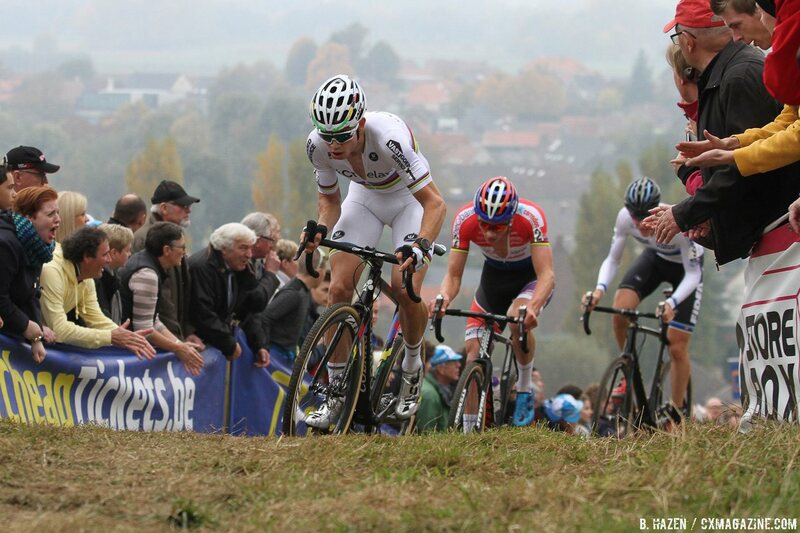 He would have to fend off challenges from both of these competitive rivals over the course of the nine trips up the Koppenberg hill to bring home his third consecutive Koppenbergcross victory and add to the growing list of accomplishments he is cobbling together at the race. Prior to this past weekend’s European Championship, the 2016 European circuit has been defined by the battles between Wout Van Aert and Matthieu van der Poel. This rivalry between Van Aert and van der Poel led to a somewhat unexpected early-race attack that blew the race apart earlier than some may have expected and dictated what would happen over the next 50 minutes. When the riders returned to the streets of Melden after the first climb up the Koppenberg, van der Poel was sitting toward the back of a long string of riders. Van Aert appeared to sense that his competitive rival was caught in a bad spot and launched a blistering three-plus minute attack up the second climb of the hill. 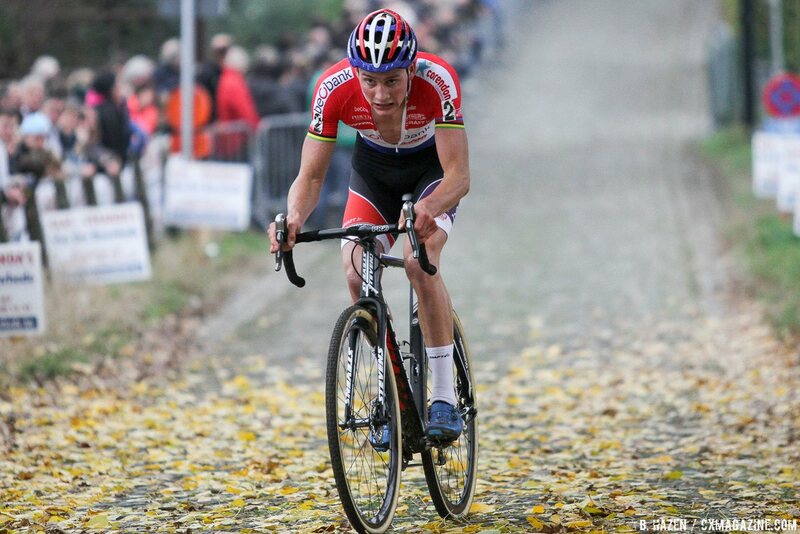 Van der Poel started the climb in about 12th position and appeared to expend a considerable amount of energy trying to bridge to the chase group that emerged behind leaders Van Aert, Aerts, and Klaas Vantornout (Marlux-Napolean Games). 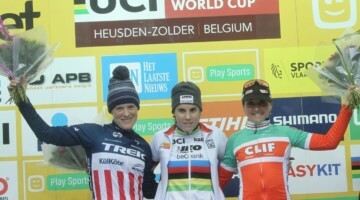 Not content with his lap two attack, Van Aert continued to push the pace on subsequent climbs up the hill, whittling down the field to just two champions, but the second jersey wasn’t the one duel-seeking fans expected. After the fourth trip up the Koppenberg hill, Toon Aerts, perhaps riding with a new sense of confidence after his upset victory on Sunday, placed himself at the front of the race with the defending world champion. With one rival dispatched on the hill, Van Aert was able to break away from Aerts on the cobbles at the top of the Koppenberg on the fifth trip up the hill. He gained a seven second advantage by the top and kept on the gas while Aerts appeared broken by Van Aert’s latest attack. 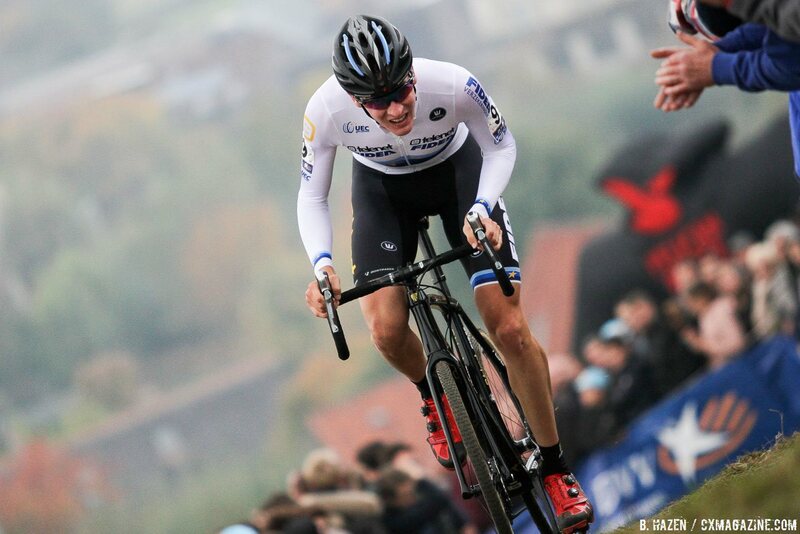 The 2016 World Champion would extend that lead to 25 seconds after climb six and stretch it to a maximum of 50 seconds before cruising home with his third consecutive Koppenbergcross victory. Going off the front with a rider as strong as Wout Van Aert can prove to be costly later on in a 60 minute race, as Toon Aerts learned the hard way. Clearly gassed from the effort, he was eventually swallowed up by the chase group and sent to the back of the seven-rider congregation. Lars van der Haar (Team Giant-Alpecin) gamely demonstrated the indecisive nature of the downhill, as he put in a few attacks that were easily erased during the ride through the streets of Melden at the bottom of the hill. On the penultimate climb of the Koppenberg hill, the chase group finally broke apart. Kevin Pauwels (Marlux-Napolean Games) put in an attack that erased 15 seconds of Van Aert’s massive lead and placed him seven seconds ahead of Lars van der Haar at the top of the hill. Van der Haar’s followed Pauwels’ lead, attacking himself and stretching out a ten second gap over the chase group of Vantornout, Michael Vanthourenhout (Marlux-Napolean Games), and Aerts. Nothing changed in the top three during the last climb up the Koppenberg hill, as Pauwels took second place, 29 seconds behind Van Aert, and van der Haar completed the podium, 5 seconds behind Pauwels. 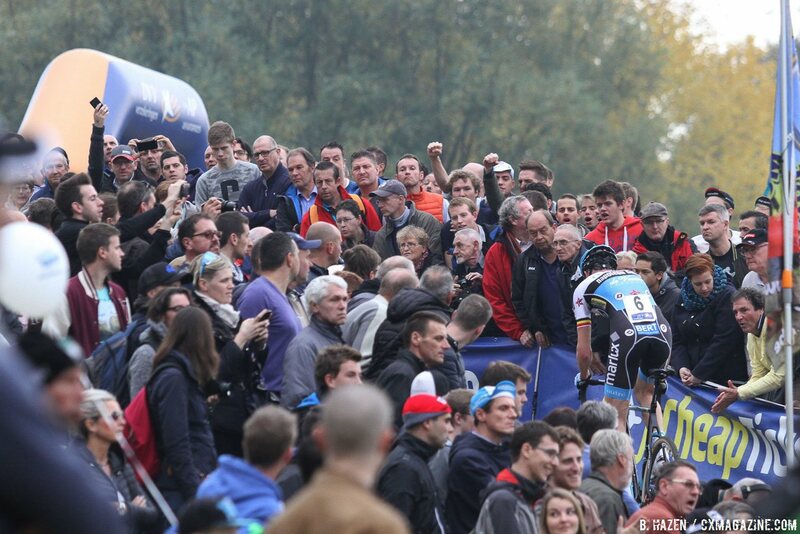 Toon Aerts recovered to finish fourth and Vantornout finished in fifth a minute behind the winner. The top ten was rounded out by Michael Vanthourenhout (1’04”), Corne van Kessel (Telenet Fidea Lions) (1’14”), Jens Adams (Crelan-Vastgoedservice) (1’18”), Laurens Sweeck (ERA-Circus) (1’34”), and Michael Boros (ERA-Circus) (1’44”). Matthieu van der Poel finished a disappointing 15th, nearly four minutes behind Van Aert, effectively crippling his chances to win the overall the DVV Verzekeringen Trofee series. Ian Field of Great Britain (Hargroves Cycles Race Team) finished on the lead lap in 18th, 4’24” behind the winner. American Eric Thompson also took the start, getting pulled with three laps remaining and ending up in 30th. 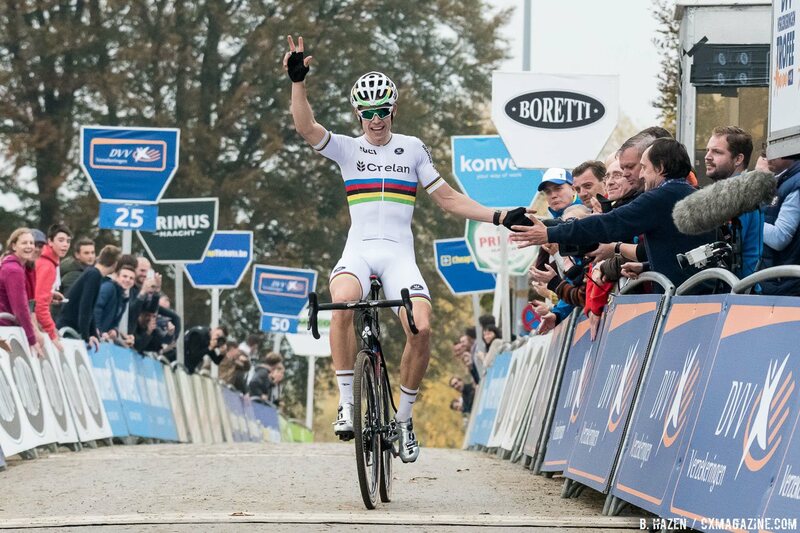 With the win, Wout Van Aert sits in first place in the DVV Verzekeringen Trofee standings. Chasing him are Kevin Pauwels (1’52”), Michael Vanthourenhout (2’00”), Lars van der Haar (2’08”), Jens Adams (2’19”) and Toon Aerts (2’21”). The next DVV Verzekeringen Trofee race. Before feasting on food and football, American cyclocross fans can feast on some Thanksgiving ‘cross at www.trekbikes.com for a live stream of the race. Miss the streaming video? Watch highlight videos here. Full results below, full photo gallery below the results. Its the WVA MVP show !!! The replay will now be devoid of suspense. Awesome race! Lots of climbing, I’m not surprised the racers all seem to hate the new course! Thank you Trek Bike for arranging hi def streams for us in the US.